The Next-Best Thing to Taking a Class From Lisa in Person! Lisa Barth is a world famous metal clay and wire jewelry artist, a sought-after teacher and a talented author who is best known for her unique gemstone bezel settings in metal clay jewelry. She is highly respected and admired both by her students and by other jewelry designers and clients who appreciate the artistry in her fine wearable art jewelry. 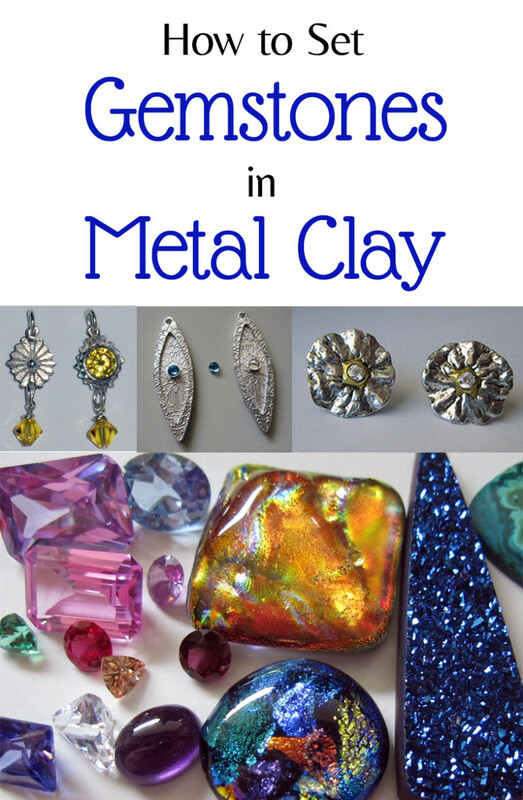 In her book, Designing From the Stone, Lisa shares her considerable expertise, techniques, and unique approach to designing bezel set metal clay jewelry with metal clay artists who are unable to attend one of her classes and workshops in person. 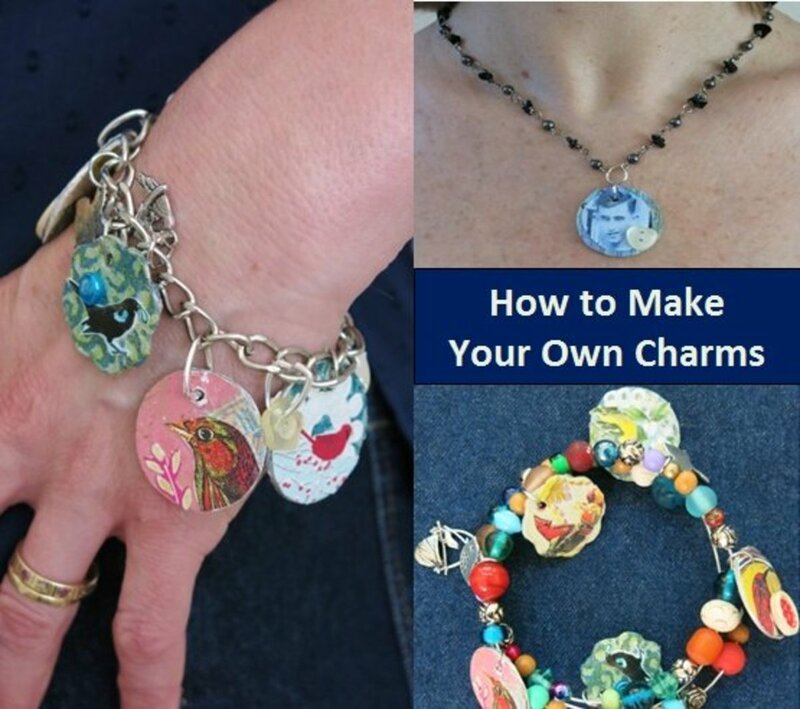 And she writes just the way she teaches in person, in a clear, easy-to-understand and supportive manner that will have you making your own one-of-a-kind gemstone bezel settings for your metal clay jewelry. 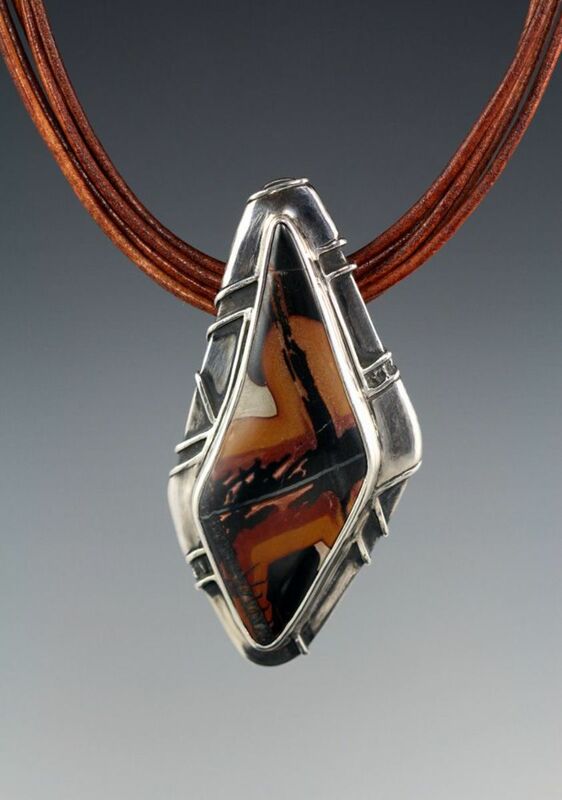 Lisa's unique approach to designing gemstone jewelry in metal clay is using the stone itself as inspiration for the jewelry design. Hence the book's straightforward title and subtitle, Designing From the Stone: Design Techniques for Bezel Setting in Metal Clay Using the Stone as Inspiration. Sometimes the patterning in a particular gemstone will inspire an echoing or related texture on the metal surrounding the bezel-set stone. Other times, a stone evokes a particular visual association. 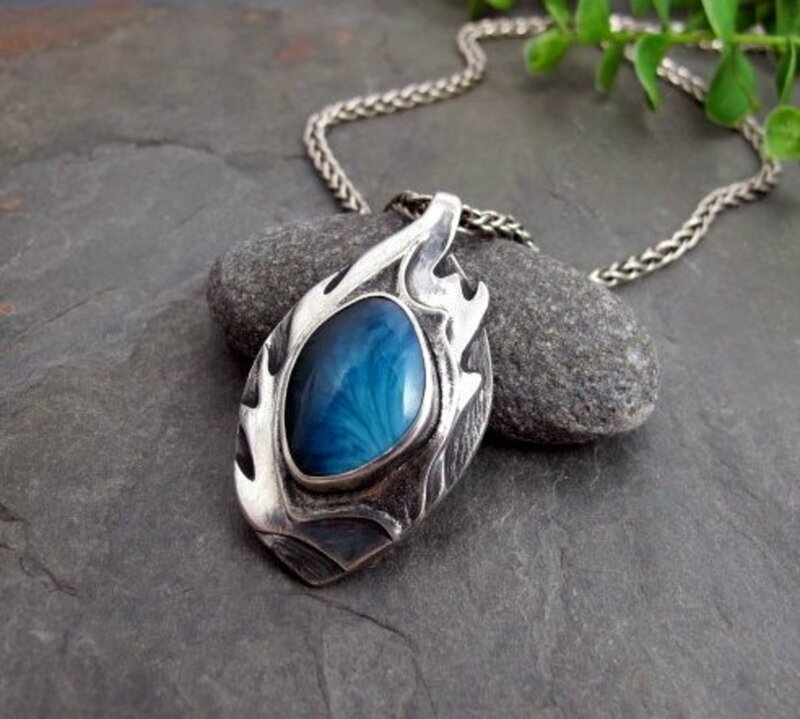 A great example of this is the pendant on the book's cover; the stunning labradorite cabochon reminded Lisa of the ocean and inspired the unusual and clever bezel setting with an adorable silver turtle poised to enter the water. After seeing three different examples of the entire process end-to-end, you'll be ready to apply everything you've learned to your own bezel set silver metal clay jewelry designs inspired by your gemstones. Note: All the projects and bezel setting techniques in the book are designed for use with fine silver metal clay. They also can be adapted for use with sterling silver clay, but the increased shrinkage of the sterling silver metal clay could create challenges. 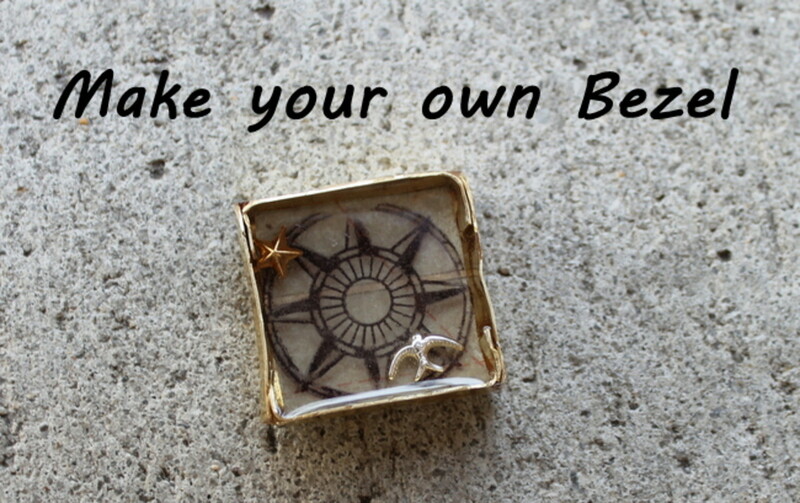 Have you ever make a piece of metal clay jewelry with a bezel set stone? Yes, and it came out great! Yes, but it didn't come out as well as I had hoped. No, but I would like to try. No, but I would like to learn how. As a metal clay artist myself and the former Senior Editor and Technical Editor of Metal Clay Artist Magazine (now online as Creative Fire), I am fortunate to know Lisa both personally and professionally. She sincerely cares about making sure her students are successful, and that desire is evident in the clear and detailed information and expert tips she shares in this book. 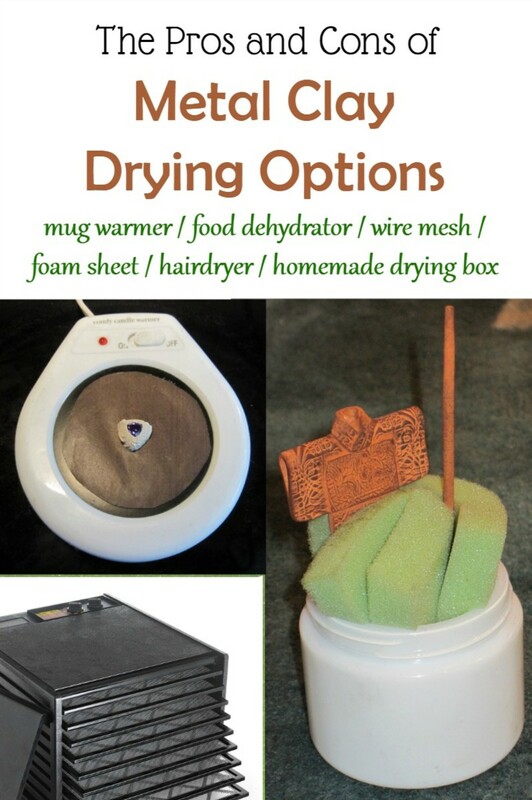 In this book, Lisa shows how to make each custom bezel using tabbed fine silver bezel wire to ensure the bezel is securely and permanently embedded in the metal clay backplate. She is a fantastic teacher, both in person and in print. Reading this book is the next best thing to attending one of her highly sought-after metal clay bezel setting classes. Lisa explains how to analyze a gemstone cabochon's shape, texture and color and think about which features you love most about the stone. Then she shows you how to emphasize those elements in your metal clay bezel setting and backplate design. She also takes you through how to make and use paper templates, work in layers and extend the design harmoniously from the front to the back for a design that is unified when viewed from any angle. She also addresses the importance making the bail, if there is one, an integral part of your jewelry design. 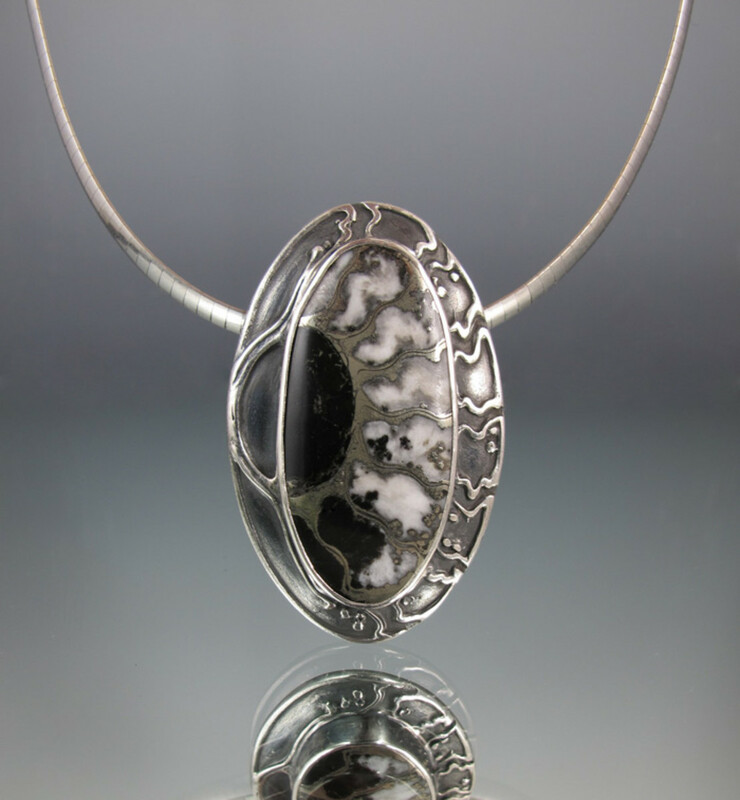 You'll learn how to mold placeholders for your stone from jeweler's investment to ensure that your bezel will still fit the stone perfectly after it has been kiln fired in the silver metal clay. 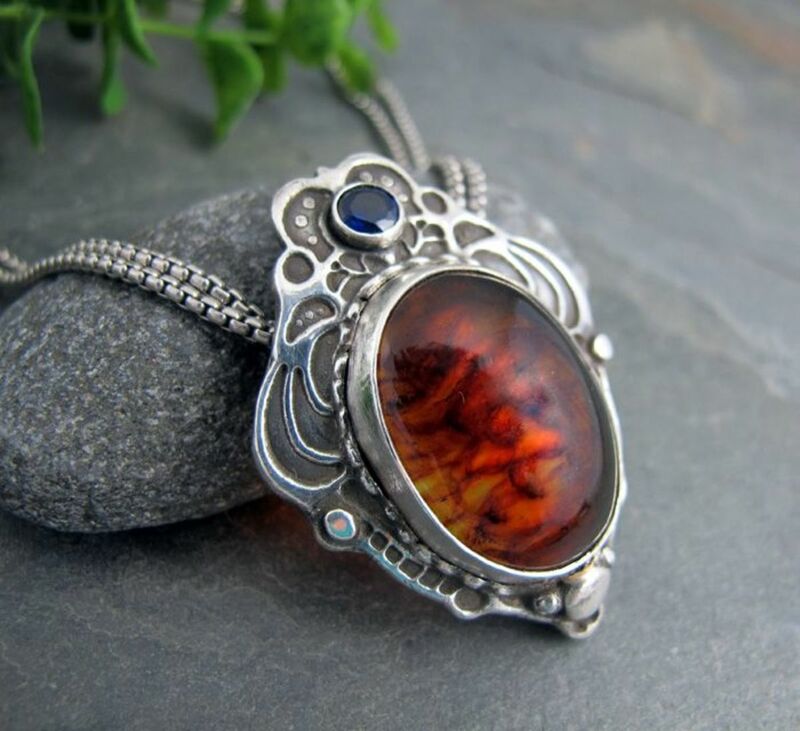 You'll also learn how to fire, finish and add a liver of sulfur patina to your piece and, finally, how to bezel set the gemstone and customize the fit to the stone if necessary. This book is more than just a master class in creating custom silver bezel settings for metal clay jewelry with world renowned teacher Lisa Barth; it's also a master class in jewelry design. Lisa goes into the elements of design: color properties, color associations and color theory; line; shape; texture; form; value; and space. She also explains the principles of design: balance; emphasis; repetition; contrast; movement; rhythm; and unity. Complementing all this educational material are three detailed, step-by-step projects that help you integrate and translate all the different techniques, design principles and lessons from the book into your own one-of-a-kind, wearable art, precious metal and gemstone jewelry designs. Lisa also is a terrific photographer and she kindly gave me permission to include some of the photos of her bezel set gemstone metal clay jewelry in this article to give you an idea of the types of jewelry you'll be able to design and create after reading her book. 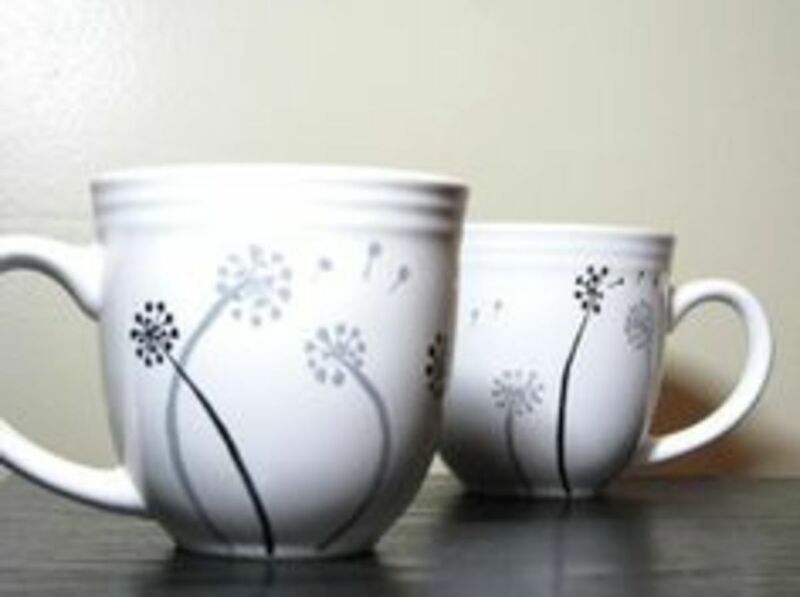 Photo credits: All photos of her work are copyright Lisa Barth, all rights reserved, and are used with her permission. 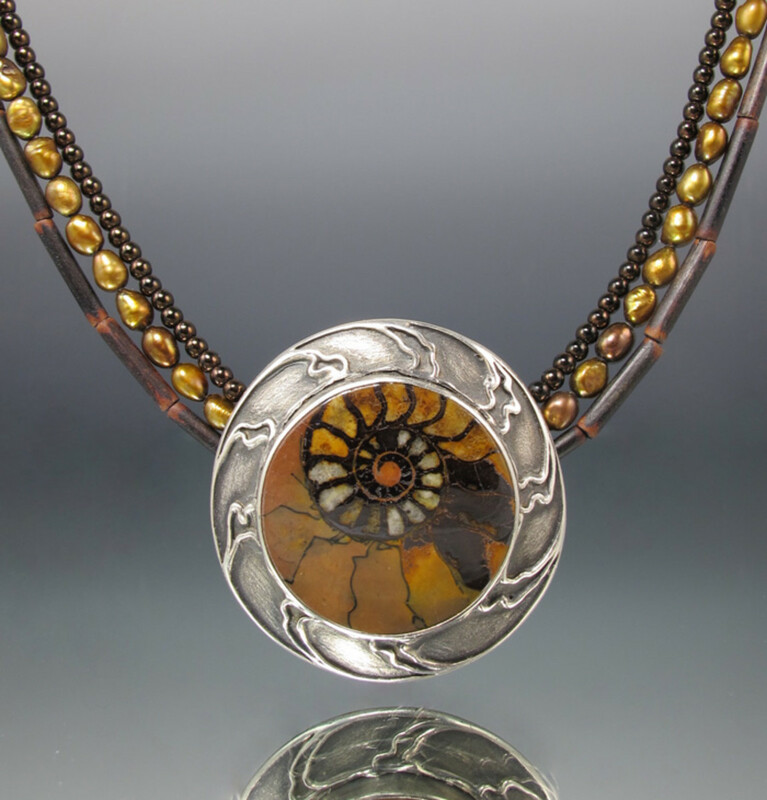 Lisa Barth sketches a rough setting and backplate design around the ammonite fossil to echo and extend its pattern onto the silver with syringe clay. 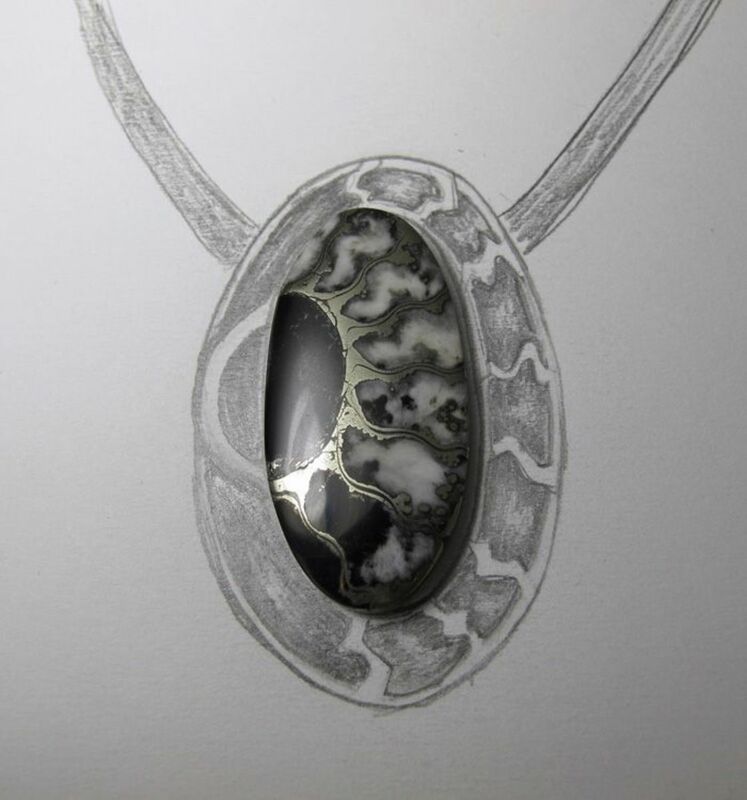 Here you can see the transformation of the rough sketch into the finished ammonite bezel setting and backplate. 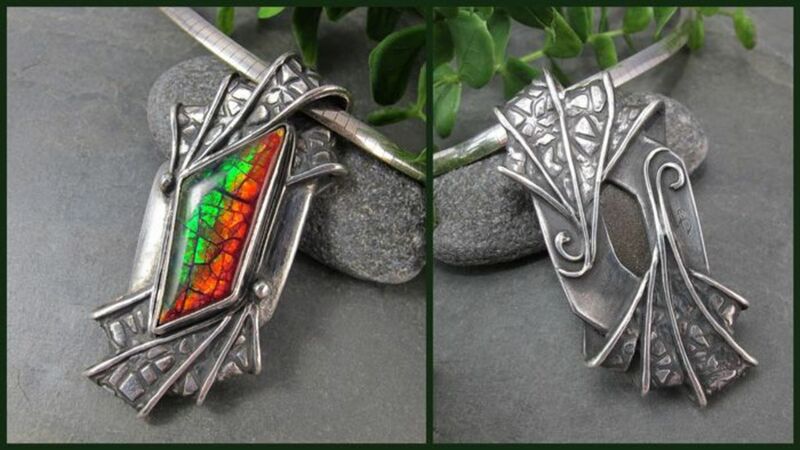 This shows how the backplate shape and texture echo the lizard skin ammolite pattern and continue on the integrated bail and onto the pendant back. I love how the coiled chambers of this polished ammonite fossil extend onto the backplate, enhancing the feeling of motion from the spiral pattern. This exquisite backplate echoes the lacy delicacy of this exceptional Russian amber stone accented with a blue sapphire. 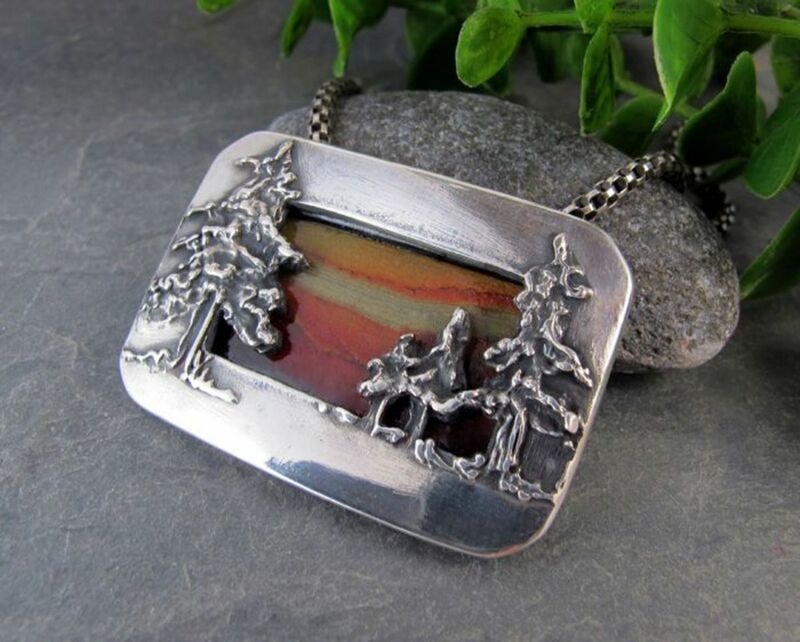 This sunset jasper stone set from the back creates a color-banded sky behind the dimensional forest trees balanced by a smooth, polished silver frame. This Indian Paint Stone pendant's backplate is a terrific example of echoing the stone's pattern onto the surrounding backplate through texture. "Designing From the Stone: Design Techniques for Bezel Setting in Metal Clay Using the Stone as Inspiration" by Lisa Barth is not only one of the best metal clay jewelry books I've ever read, it's also one of the best jewelry making and design books I've ever read, period. Whether you're a metal clay jewelry artist or someone who is interested in designing and creating beautiful, professional jewelry using fine silver metal clay, bezel wire and gemstone cabochons, this book is a must-have for your metal clay and jewelry making library. I've written a comprehensive and detailed guide to setting gemstones in metal clay that covers a wide range of different stone setting techniques including bezel, gypsy, layered and other settings for stones that can be fired in place and for those that must be set after firing. Was My Review of Designing From the Stone Helpful? Do You Want to Learn to Make Silver Jewelry From Metal Clay Using Lisa Barth's Bezel Setting Techniques? Thanks, Sandy! I adore Lisa's work. It's even more beautiful when you see it in person. And she's very thorough with her explanations of her techniques so that others can use them successfully to make their own stone-inspired metal clay bezel settings for their gemstone jewelry designs. Wonderful review. The jewellery is interesting and beautiful. Thank you, Gayle. You'll LOVE Lisa's book. Her lessons on the elements and principles of design are as valuable as her unique approach to designing bezel settings. Thanks so much for your visit and your comment! Great review Margaret. This is a book on my "to-get" list now. I've always wanted to try bezels with metal clay. @a2article: Thank! Glad you enjoyed the article. @PriyabrataSingh: So glad you enjoyed these metal clay gemstone setting techniques and Lisa Barth's wonderful book! impressive. i like the way. Great work and i love the magic behind the art of perfection.I will try some. Beautiful pieces! 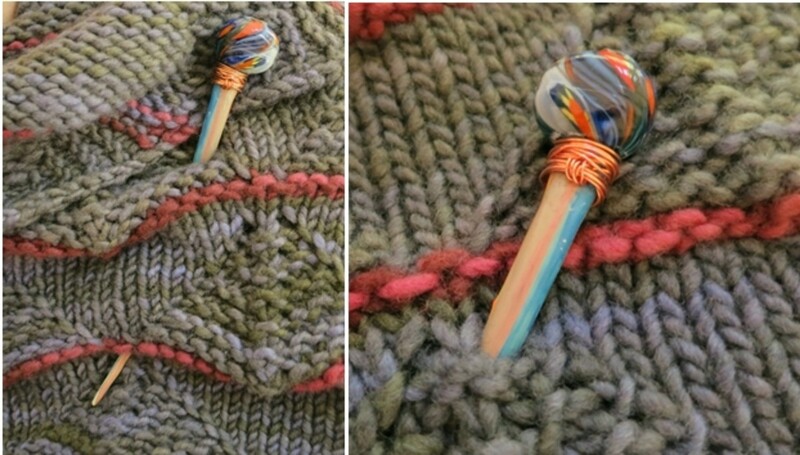 I would love to try my hand at this craft. Great review and amazingly gorgeous jewelry! 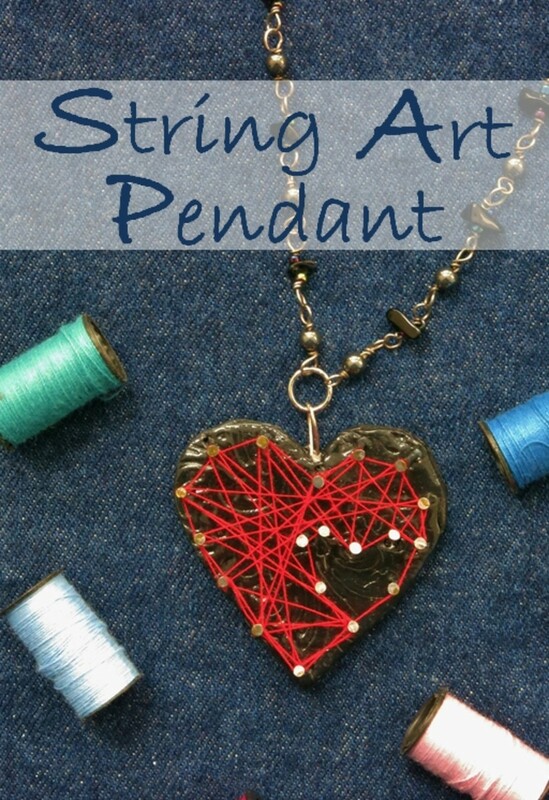 I'll leave the jewelry making to the artists, though it might be fun to give it a try! Beautiful jewelry. Very artistic medium. 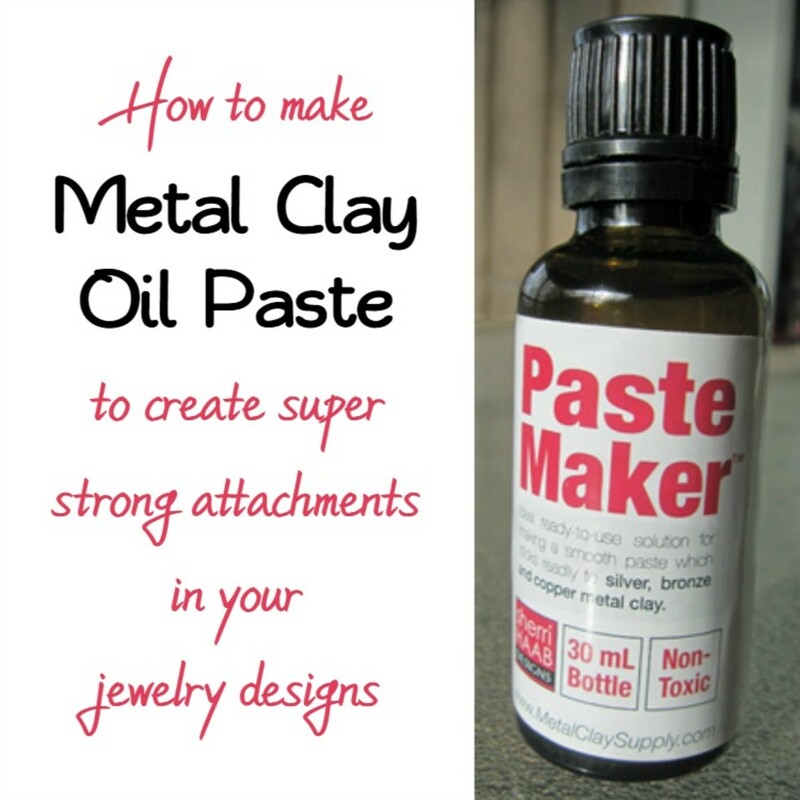 I had never heard of metal clay before so I googled it. "Metal clay first came out in Japan in 1990". @Gypzeerose: Rose dear, what a truly lovely compliment!!! Big hugs to you!!! As you probably know by now, I am one of your greatest fans. I always like to come to see what you are up to even if I will never try the craft. Pinned to my board "Crafts I love." Yes I would! I make a boho style jewelry and chain maille jewelry. I love 'playing' (as I tell my hubby) with my stones and metals. @Diaper Bag Blog: Thanks so much, stajo82! I really appreciate your kind comments on my review of Lisa Barth's wonderful book, Designing From the Stone. Superb ... I love gemstone jewelry presented here... And you have really nice pictures ... thumbs up !!! Exquisite! I want that turtle bezel piece featured on the book cover. Stunning works of art. Thank you for introducing me to this extremely talented artist. Wow. I love gemstones. When I was a kid my greatest wish was for a rock tumbler but a gift that was not to be realized. I still enjoy rocks and gemstones but have never tried my hand at making anything from them.